Lots of interesting news this week: a ZD Net utility to overclock the 2008 Mac Pro, more on running OS X on non-Apple hardware, an autofocus webcam with full Mac support, and the release of Darwine 1.0, a Mac/Darwin version of WINE so you can run many Windows apps on Intel Macs without running Windows. We'll have more news in The 'Book Review and iNews Review on Monday. Should Apple Let PC Users Run Mac OS X? "When the first IBM PC clones that were clocked faster than the original at 4.77 MHz appeared in the eighties, games freaks noticed that many of their games became faster. The Cessna 182 of the Sublogic flight simulator flew at the speed of a Eurofighter. So the bus clock speed is in principle not a good source for real time. "Microsoft has now learned this, but clearly Apple has not. If you carry out benchmarks such as Cinebench or Geekbench after overclocking, the benchmarks do not indicate any improvement in performance at first. But if you resort to a stopwatch, the higher performance resulting from overclocking can indeed be verified. You also notice that the system clock runs significantly faster after overclocking the computer." "While overclocking tools are quite common in the Windows PC world, Macintosh owners haven't had the same luxury. "However, ZD Net's German site has developed a utility, ZD Net Clock, to change all that. Using the tool, ZD Net says, a Mac Pro using a 2.80 GHz processor can be overclocked to higher performance than the fastest 3.20 GHz model, saving $1,600 under Apple's current price scheme." "As overclocking of Mac Pro is now available and other Apple hardware should follow soon, we have decided to provide some tips and recommendations...."
"Now, before you salivate at the chance to get a 'free' performanceboost, remember you rarely get somethin' for nothin'...."
The latest reports about a little-known company that's attempting to sell Mac clones - PCs that run Mac OS X Leopard - have ignited the imagination of PC users all over the world. The ability to run Leopard and earlier Mac OS versions on a PC might drive changes in the PC and Mac markets, regardless of whether Psystar - the company that started the fire - actually manages to build a successful, lawsuit-proof business. Link: Should Apple Let PC Users Run Mac OS? "EFiX is the new dongle that allows you to install Mac OS X on your PC... Now that's a revolution! "EFiX allows the user to install Mac OS X straight from the original DVD without having to worry about patches, replacing files and anything like that. That means you can buy a regular compatible PC, Mac OS X and EFiX and enjoy Mac OS X. "With EFiX you can install Mac OS X Leopard or Leopard Server from the original retail DVD... and installation is easy... no prior knowledge of OS X is necessary." "'Well, here it is. The new MSI Wind running Kalyway 10.5.2 (modified Leopard install). I still have to make some small adjustments, like the resolution and the wireless network card, but I couldn't resist posting these images that I'm sure will get the interest of more than one person. Ethernet and Bluetooth work right out of the box, so I'm really expecting a lot from this small notebook....'"
"Apple's decision to not offer a Blu-ray drive as an option on the Mac Pro has been frustrating many users for quite some time. PC users have long enjoyed the expanded storage and high-definition content available on the new format. 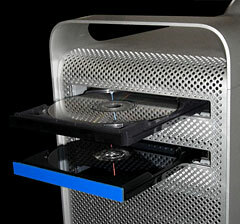 "This has not stopped enterprising third parties from adding Blu-ray drives to their systems. The good news is that Apple decided to make the Mac Pro easy to upgrade in the field. The bad news is that Apple chose to use the more traditional (and less expensive) IDE (PATA) interface for it's optical drives. PC motherboard OEMs are cramming more and more SATA ports on their boards, so optical drive makers are switching to SATA as well. This makes it hard to find IDE based Blu-ray drives. 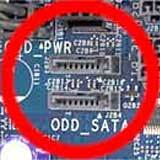 "Enter the gang at Cooldrives.com with their SATA-PATA adaptor board. This little gem plugs into the back of the SATA Blu-ray drive and allows you to easily install it in the Mac Pro." "My broadband connection was barely 24 hours old when work began on migrating to the latest version of Ubuntu. Hardy Heron, as it's called, is very nice on the mini. What follows is how I did it, what I used, what worked, and what didn't. "24 hours after the install, I could not be more pleased. I am listening to a CD, blogging, charging my Sansa Fuse MP3 player, and glad to be free of Apple's OS X. The install went well, and the only real glitch was an issue with the Apple keyboard. It was relatively quick and painless, and things are working just fine at the moment." "Today's IT managers face tough choices. PCs that run fine today have an uncertain upgrade path, now that Microsoft has chosen to discontinue Windows XP. Upgrade costs associated with Vista, coupled with the ever-escalating cost of application licenses, make switching to desktop Linux an increasingly attractive option. "For many businesses, however, it's difficult to know where to begin. The Linux market is broad and thriving, with myriad options to choose from. Most organizations will want to phase in Linux gradually, which in many cases will mean supporting a heterogeneous computing environment for the first time. As a result, it can be hard to predict where software incompatibilities might affect critical business processes. "Fortunately, the future of Linux on the business desktop has never been brighter. Bolstered by contributions from some of the biggest names in IT, today's Linux offers a rich, highly functional user experience to compete with any proprietary OS...."
PR: Darwine allows Darwin and Mac OS X users to run Windows applications. The Darwine project intends to port and develop WINE as well as other supporting tools that will allow Darwin and Mac OS X users to run Windows Applications, and to provide a Win32 API compatibility at application source code level. These are unofficial builds of Darwine. 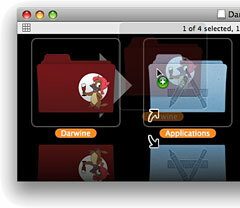 Darwine is the OS X flavour of Wine. Official Darwine builds are "a little bit" offsync to the regular wine releases, that's why I build it myself. Additionally, they come with a built in freetype library for correct fontmetrics and antialiasing. Darwine runs on Tiger and Leopard, only Intel processor, sorry. PR: To help you stay close to those who matter most, Logitech, a leading manufacturer of webcams, today unveiled its first Mac-compatible webcam with premium autofocus technology and Carl Zeiss optics: the Logitech QuickCam Vision Pro webcam for Mac. The new Logitech webcam delivers image-perfect detail and clarity, and exceptional video calling with iChat and Skype. "With this new webcam for Mac computers, we've integrated our most advanced video technologies to truly enrich your video-calling experience," said Gina Clark, general manager and vice president of Logitech's Internet Communications business unit. "The lens and autofocus, the sensor and the lighting software all contribute to create image-perfect detail and clarity. Whether you've used a standalone or an embedded webcam in the past, you'll be amazed at the difference in quality our new webcam makes." To deliver image-perfect detail and clarity, the Logitech QuickCam Vision Pro webcam for Mac combines Logitech's premium autofocus technology with Carl Zeiss optics. The new Logitech webcam uses a voice coil motor for its autofocus system, instead of a stepper motor. Focusing is fast and fluid - crisp even in extreme close-ups only 10 cm from the camera lens. Logitech's autofocus system compensates for changes in image-edge sharpness and refocuses images in less than three seconds. And through its exclusive collaboration with Carl Zeiss, Logitech ensures that the lens meets the world-renowned Zeiss standards for design and manufacturing to achieve superior sharpness in a compact, lightweight design. 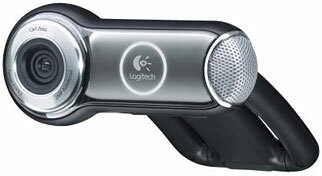 The 2-megapixel sensor helps the Logitech QuickCam Vision Pro webcam for Mac capture video images in high resolution. It is assisted by Logitech's RightLight™2 Technology, which enables the webcam to adjust intelligently in dim or harshly backlighted situations. When you and your loved ones use the new Logitech webcam with iChat or Skype, you can enjoy VGA-quality video at up to 30 frames per second - four times as sharp and twice as smooth as any other video-calling solution - at no additional charge. The new Logitech webcam is also plug and play right out of the box, so you can make a video call immediately - no software required. When using your webcam to capture video to store on disk or send to friends, the QuickCam Vision Pro records sharp video clips in the 720p high-definition (HD) video format (960-by-720 pixels). Complementing the style of your Mac computer, the new webcam for Mac computers presents a black-and-silver profile with a prominent built-in silver microphone. The Logitech QuickCam Vision Pro webcam for Mac is expected to be available in the US and Europe beginning in July. The suggested retail price is $129.99. PR: Blu-ray Disc (BD) technology, with its ability to record to 25 GB single-layer and 50 GB dual-layer discs, is the next generation in optical disc storage and MCE Technologies has brought it to the Mac. The MCE Technologies Blu-ray Internal Recordable Drive for Apple Mac Pro and Power Mac is completely preconfigured for easy user installation. In addition to writing to 25 GB single-layer and 50 GB dual-layer Blu-ray discs, the MCE Technologies Blu-ray Internal Recordable Drive is compatible with all DVD and CD recordable media including DVD±R/RW + Dual/Double Layer, DVD-RAM, and CD-R and CD-RW. The MCE Technologies Blu-ray Internal Recordable Drive includes a 25 GB Blu-ray (BD-RE) rewritable disc for instant storage right out of the box. Store up to 12,500 music tracks, 50,000 photos, or 4 hours of HD video on a single 50 GB Blu-ray Disc. The MCE Blu-ray Disc Internal Recordable Drive for the Mac Pro and Power Mac incorporates a state-of-the-art blue-violet laser and ushers in the next generation of optical disc storage. The drive also writes to all DVD±R/RW + DL (Double/Dual Layer) media and CD-R/RW media and is compatible with all Apple's iApps. The figure to the right shows the difference in spot size between a Blu-ray laser and standard DVD recording laser. The smaller, tighter Blu-ray spot size means more spots (data) can be recorded to the disc resulting in data capacities of 25 GB and 50 GB per Blu-ray disc. Buy your MCE Blu-ray drive online. PR: We are proud to present EFiX our wonderful work of art and function to the world. EFiX is the best solution for running Mac OS X on PCs. It allows the user to install Mac OS X straight from the original DVD without having to worry about patches, replacing files and anything like that. Ability to install Mac OS X Leopard and Leopard Server from original retail DVD. Average users can easily install Mac OS X without fear of needing professional knowledge. Update your system with official Apple Updates. Online updates of EFiX firmware. An Interactive system boot selector. Working power management Features such as Shutdown, Reset, etc. PR: Newer Technology, Inc. (NewerTech), the leading developer of PC, Macintosh, iPod, and iPhone performance upgrades and accessories, today announced the new Guardian MAXimus 300 GB 10,000 rpm "Triple Interface" FireWire 800/400/USB 2.0 model, the fastest and most reliable Plug & Play RAID-1 mirror external storage solution available on the market for consumers and business professionals alike. The new Guardian MAXimus 300 GB 10,000 rpm offers users of all levels and operating systems the fastest, most reliable method to back-up and store critical data with Plug & Play ease. Always guarding against data loss and costly system downtime, Guardian MAXimus writes the same information in real-time "live activity" to two 300 GB 10,000 rpm drives for a "mirrored" copy. The Guardian MAXimus 300 GB 10,000 rpm utilizes the Western Digital VelociRaptor™, the fastest SATA drive on the market, with data transfer rates up to 100 MB/s, OS X "Leopard" Time Machine readiness, and a "Triple Interface" of two FireWire 800, one FireWire 400, and one USB 2.0 ports to provide the performance, flexibility, and reliability required for demanding audio/video, photo-editing, and 3D rendering applications. Guardian MAXimus provides the security of a highly reliable RAID 1 hardware-based storage solution at a low price. And unlike high-priced, hard to configure RAID 1 corporate storage common in high-end servers, Guardian MAXimus is FireWire/USB Plug & Play easy, so no controller cards, software configuration, or driver downloading is required. Guardian MAXimus can access data via any of its supported interfaces or move between different computers utilizing those interfaces with complete interoperability. 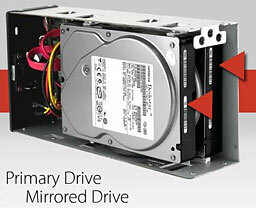 300 GB, 10,000 rpm Dual-Drive Solution. 32 MB of drive cache (16 MB per drive). Custom Oxford 924 Based Bridge Solution. 2 FireWire 800 9 pin ports. 1 FireWire 400 6 pin port. 1 USB 2.0 "B" port - backwards compatible with USB 1.1. Front panel drive status LEDs. 9.3" x 2.8" x 5.6" size, shock-resistant for maximum portability. US/International 90~240V 4.2A UL-listed power supply. FireWire 800, FireWire 400, and USB 2.0/1.1 double shielded connecting cables included. Compatible with Apple OS 8.6 to 9.2.2, OS X 10.1.x and later (10.2 or later required for FW800 and USB 2.0), and Windows ME and later operating systems. Includes ProSoft Engineering Data Backup 3, NovaStor NovaBACKUP, and Intech SpeedTools Utilities software (a $200 retail value). 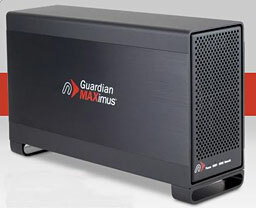 Guardian MAXimus 300 GB 10,000 rpm is available immediately, priced at $899.99 MSRP from NewerTech's exclusive distributor, Other World Computing, as well as through the retail channel. PR: Newer Technology, Inc. (NewerTech), developer of PC, Macintosh, iPod, and iPhone performance upgrades and accessories, announced today that the NewerTech eSATA Extender Cable, the first Mac Pro 8-Core/Quad-Core extender cable available on the market, is now fully compatible with all Mac Pro models introduced from 2006 to the present. The NewerTech eSATA Extender Cable offers Mac Pro owners the ability to utilize the two unused internal SATA ports on the motherboard and add two external accessible SATA ports. The NewerTech eSATA Extender Cable is specifically engineered to be a "Perfect Fit Solution," so it accurately routes inside a Mac Pro case. By utilizing the hidden potential of the Mac Pro, users can connect any two SATA-I or SATA-II devices and expand their data storage configuration to up to six hard drives. A step-by step color illustrated manual is included for quick and easy installation. Macworld Calls It "A Nifty Accessory"
In awarding the NewerTech cable an 8 out of 10 rating, the Macenstein.com site said, "Very affordable solution for adding 2 eSATA ports to your Mac Pro . . . the directions are excellent." Macworld Magazine called it "a nifty accessory." 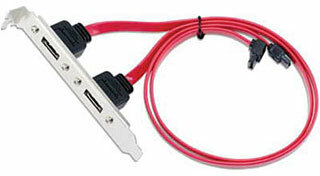 Mac Pro users also praised the NewerTech eSATA cable at xlr8yourmac.com : "Works great. Very, very fast." "A very slick way to add two more full-speed SATA II ports to your machine for nearly no cost." The NewerTech eSATA Extender Cable is priced at $24.95 MSRP and is available immediately from NewerTech's exclusive distributor, Other World Computing, as well as through the retail channel. PR: Corsair, a worldwide leader in high performance computer and flash memory products, announced today the launch of their new Mac Memory kits made especially for the newest Mac Pro desktop systems. The new Corsair Mac Memory kits are fully-buffered 800 MHz solutions, available immediately in 4 GB (2 x 2 GB modules) DIMM kits. Utilizing Mac Pro-specific heat sinks and performance IC's, these new memory modules help unleash the high performance potential of Mac Pro desktop platforms. All Corsair Mac memory modules are qualified at Apple Test Labs in California and are 100% compatibility-guaranteed with a lifetime warranty. "The new Apple Mac Pro desktops are high-performance dynamos that require large amounts of memory," said Richard Hashim, Director of Product Marketing at Corsair. "Upgrading the Mac systems with 4 GB of Corsair's new 800 MHz Mac Memory FB-DIMMs offer end-users the ability to unleash even more performance from their Mac Pro desktop platform," added Hashim. The new Corsair Memory Line for the Mac Pro is immediately available through Corsair's authorized distributors and resellers worldwide, priced at $250 for the 4 GB Mac Memory kit. Corsair memory products are backed by a Limited Lifetime Warranty. Complete customer support via telephone, email, forum and Technical Service Xpress is also available. PR: PlumChoice, a provider of remote technical support services to home, home office, and small business customers, announced today that it has extended its Internet-based support services to Macintosh products ranging from Leopard and Tiger-based Mac computers to Apple iPods, iPhone and AirPort routers, firewalls and printers. The company previously focused primarily on Windows-based products as well as consumer products (CE) and devices. "Adding remote support for Mac products to our comprehensive subscription support service is a natural extension of the services we have been providing for Windows-based products for seven years," said PlumChoice founder and CEO Ted Werth. "Users of both platforms can now get their problems identified and resolved quickly and efficiently, 24 hours a day, through our experienced team of PC and Mac technicians." PlumChoice's service goes beyond answering frequently asked technical questions to provide full-service, monitored, enterprise-style solutions to technology problems, including equipment set up, training, ongoing support and monitoring, and repair on PCs/Macs, networks, printers, MP3 players, PDAs, digital cameras and more. Service is provided 24x7 by trained, experienced, US-based technicians who analyze and repair the customer's equipment through a secure Internet connection, eliminating the time and expense of telephone, on-site or in-store fixes. This provides a convenient alternative for home, home office and small business customers as well as students who need back-to-school or mid-semester computer care. Since 2000, PlumChoice has become the nationwide leader in providing trusted remote technical services for the home, home office and small business. PlumChoice leads the industry in technical innovation and integrated services, giving customers affordable solutions to their technology problems anytime, anywhere. Through its exclusive SAFElink platform, PlumChoice offers comprehensive, flexible service options (one-time, per-minute and subscription plans) on networking, software applications, personal computers & laptops, printers, peripherals, MP3 players, digital cameras, mobile devices/PDAs and more.